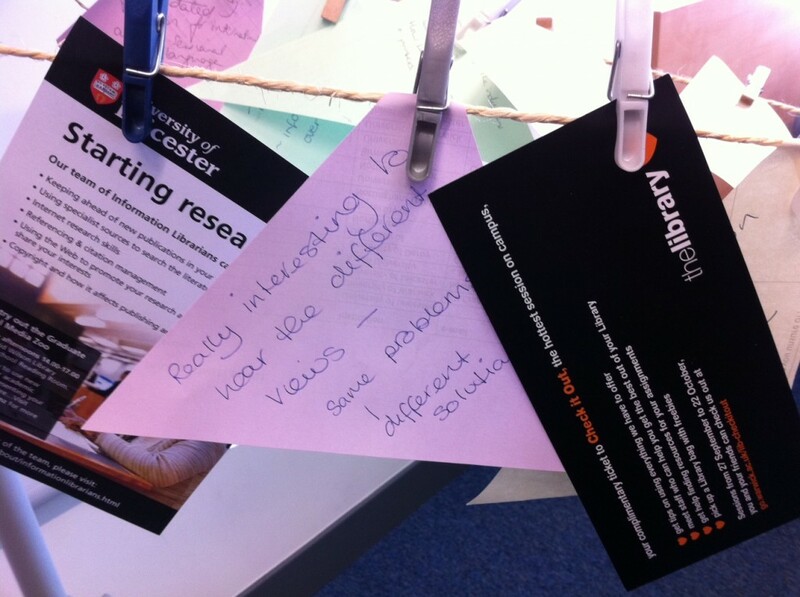 Over the summer I wrote a post about ideas for library inductions following a very successful workshop on the topic. It has become the most visited post on this blog and so, now that induction season is upon us, I thought I’d write a follow-up about what we’re doing at Warwick. Library orientation has always been a library-wide project with staff from all teams getting involved in the delivery. The overall organisation however has been overseen by staff from the Enquiry Support Team. This year things have been different, an Induction Planning Group was formed to gain input from across the Library in the development of a new programme. The group, which I chair, has over the past few months revamped our central library orientation and created Get Started. The website provides answers to some frequently asked questions from new students. 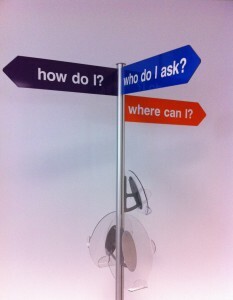 The questions are divided into three categories: how do I, where can I and who do I ask. The site combines video tutorials and text. The orientation tours are running four times a day for the first three weeks of term. We have around 40 library staff who have volunteered as tour guides and members of the Induction Planning Group have taken responsibility for different areas of the day-to-day running. The tours take in 8 stations on the first two floors of the library and show the whole process of how to find, borrow and return a book. One of the best aspects of Get Started is the branding. We are using a signpost with pointers for each of the three categories of question. Each category is colour coded so everything we create for each can be tied together visually. We’ve got flyers and bugs and a proper signpost on Floor 1 which is where the tours start. In addition to Get Started the Academic Support Librarians also deliver tailored induction sessions within the academic departments. Over the next few months I will be participating in the CPD23 programme, 23 Things for Professional Development. Whilst the tasks that I complete as part of this will form the bulk of content on this blog over the summer I will also try to post additional stuff too. I did consider setting up a separate blog but as I use this blog as a reflection tool for my CPD already it seemed foolish to separate the two. Firstly, I am in no way involved in running it. Which is great! My two previous experiences of the programme have been as a member of the team delivering the programme so I’m really looking forward to taking part solely as a participant. Secondly, the content and themes covered in this programme have a different focus. Both Ox23 and UoW23 were about introducing the participants to social media sites, showing their relevance to libraries and how they can be used by librarians. While CPD23 covers some of those topics, blogging and current awareness for example, it goes broader than that. It also looks at creating a personal brand, networking offline (as well as on), opportunities for training, and advocacy. So that’s me and thing 1 done. Earlier this week I attended an exchange of experience event on inductions at De Montfort University. It was organised by Kaye Towlson and based on the TeachMeet model. We were also able to share examples of our marketing and branding as can be seen in the photo below which includes a Check It Out flyer from Warwick and brochure from Leicester. What I especially enjoyed about this event was that all attendees contributed something. It felt very much like a collaborative effort and equal exchange of experience. Some of us gave short presentations, and others produced posters. All the presentations will be on SlideShare at some point and I’ll update this post with a link when they’re up. The rest of this post is a summary of my notes from the presentations, with my slides at the very end. In a future post I’ll write more about what we’re doing at Warwick. All staff in the Learning and Teaching Team at BCU are required to complete a PGCert. The use of rounds was something that Christiana Titahmboh picked up from her PGCert course. These rounds were used in induction sessions after a tour, or presentation, to engage the group. Essentially, you open up the floor to the group for them to make observations and ask questions about what they have just seen. It works particularly well for postgraduate students and small groups. Another benefit is that you get instant feedback on the session. Leicester apply a flexible approach to inductions so that sessions can be tailored to specific subject groups and study levels. Unlike the other institutions at the event all inductions are done in the departments. A virtual tour, using annotated PowerPoint slides is used to show the physical library. This is favoured over a video because it can be easily kept up to date and adapted to suit the audience. In addition to the departmental induction sessions a weekly email is sent out over the first few weeks of term to provide refresher information about specific topics, including: library membership, self-issue and return, study zones and electronic resources. Aston are in a unique position with all departments timetabled in for library inductions. Their inductions are run as orientation sessions with three demonstration areas on the ground floor. The demonstrations areas are: printing, reserve and collect, and take control. The first does exactly what it says, the second shows the self-issue and return machines and the third is a catalogue demo and introduction to the Information Specialists. At Nottingham Trent inductions are run by the subject librarians. For them, the number of students in the group dictates the approach taken. Their library inductions include an IT element as this information is not delivered by anyone else. They also provide refresher sessions scheduled later in the term to give students a chance to actually use the library and then come back to ask questions or clarify information. At DMU indcutions in the past have been very traditional including a presentation and guided tour. A number of factors, including staff to student ratios and poor attendance have prompted a revamp for this year. The key elements of their new induction programme is that is interactive, multimedia, multimodal and learner-centred. The programme combines an e-induction to cover the basics and a library trail, or treasure hunt. At Warwick this year we are looking to streamline our inductions. In previous years there has been both departmental inductions and a central programme, called Check It Out. In the coming year we are re-launching the central programme as Get Started. The main focus of this will be an area for Get Started on the library website where all of our induction materials can be hosted. There will also be sessions running within the library and resources for subject librarians to use in departmental inductions. The emphasis is on flexibility so that we can provide consistent information no matter what method of delivery is used. Update 27/6: most of the presentations from the event are now available on SlideShare.